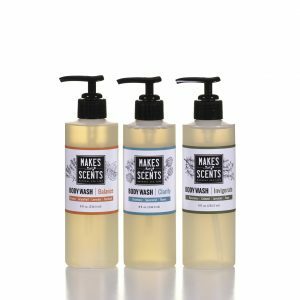 Gently cleanse and nurture hair and body with natural, sulfate-free shampoo, conditioner, and body wash. Carefully formulated to clean and nourish hair and skin without parabens, sulfates and artificial colorants, our shampoos, conditioners and body washes are made with the finest natural ingredients. 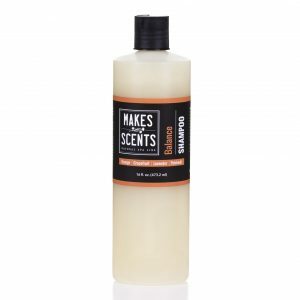 Indulge in the goodness and delicate aromas of rosemary, lavender, sage, orange, grapefruit, patchouli, and spearmint. Like all of our natural spa and body products, they are 100% vegan and cruelty free. Never are Makes Scents Natural Spa Line products (or their ingredients) tested on animals! Order today and contact us for wholesale pricing at 717-824-3094 or by email at Info@MakesScentsSpaLine.com. Also, ask about how we can custom-formulate a private-label product specifically for your spa or resort. A unique moisturizing shampoo formulation containing healing aloe vera and flax seed extract that will leave hair soft, clean, healthy and full of shine. Available in 16 fl oz. and professional sizes including gallon containers. 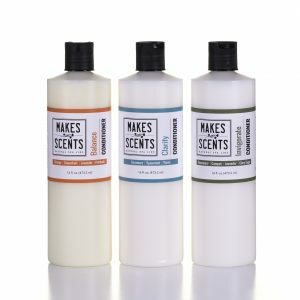 For professional spa product pricing, contact us by phone at 717-824-3094 or by email at Info@MakesScentsSpaLine.com. Our shampoo is earth & animal friendly and is free of parabens, formaldehyde, urea, mineral oil, petroleum, PG (propylene glycol), PEG (polyethylene glycol), harsh detergents like sodium lauryl sulfate (SLS) & sodium laureth sulfate (SLES), drying SD alcohol, DPG (dipropylene glycol), TEA (triethanolamine), MEA (monoethanolamine), DEA (diethanolamine), DEP/phthalates, butylene glycol, artificial colors and synthetic fragrances. Available in 16 fl oz. and professional sizes including gallon containers. This clarifying and revitalizing shampoo helps to eliminate environmental build-up on hair and scalp and stimulates the scalp to produce healthy, strong hair. Made with natural ingredients including aloe vera, flax seed extract, panthenol (vitamin b5), as well as rosemary, spearmint and white thyme essential oil, to help thicken, strengthen and revive dull, devitalized hair. Our unique, formulation including aloe vera, flax seed extract and panthenol (vitamin b5) will leave hair clean, soft, manageable, healthy, and full of shine! Essential oils of rosemary, cajeput, lavender and clary sage invigorate and balance the senses while producing hair that bounces with body and shines from roots to ends. A unique moisturizing hair cream formulation containing healing aloe vera, olive and grapeseed oil, panthenol (vitamin B5) and hydrolyzed rice protein that leaves hair soft, healthy and full of body and shine. Replenishes natural moisture without leaving anything behind to weigh it down. Available in 16 fl oz. and professional sizes including gallon containers. 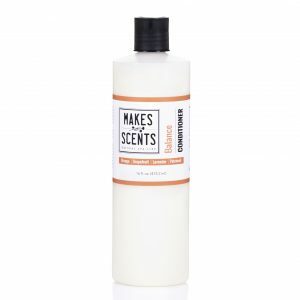 For professional spa product pricing, contact us by phone at 717-824-3094 or by email at Info@MakesScentsSpaLine.com. Conditioner is earth & animal friendly and is free of of parabens, formaldehyde, urea, mineral oil, petroleum, PG (propylene glycol), PEG (polyethylene glycol), harsh detergents like sodium lauryl sulfate (SLS) & sodium laureth sulfate (SLES), drying SD alcohol, DPG (dipropylene glycol), TEA (triethanolamine), MEA (monoethanolamine), DEA (diethanolamine), DEP/phthalates, butylene glycol, artificial colors and synthetic fragrances. A unique, natural moisturizing hair cream formulation containing healing olive and grapeseed oil, panthenol (vitamin b5) and hydrolyzed rice protein that leaves hair soft, healthy and full of body and shine. Essential oils of orange, pink grapefruit, lavender and patchouli balance and uplift the senses. A unique, natural moisturizing hair cream formulation containing healing olive and grapeseed oil, panthenol (vitamin b5) and hydrolyzed rice protein that leaves hair soft, healthy and full of body and shine. Replenishes hair’s natural moisture without leaving anything behind to weigh it down. The blend of rosemary, spearmint and white thyme essential oils reinvigorates hair so it’s more manageable, softer and full of shine. A unique, natural moisturizing hair cream formulation containing healing olive and grapeseed oil, panthenol (vitamin b5) and hydrolyzed rice protein that leaves hair soft, healthy and full of body and shine. Replenishes the natural moisture in hair and detangles hair without weighing it down. A blend of rosemary, cajeput, lavender and clary sage oil reinvigorates hair so it is more manageable, softer and full of shine. Gently cleanse and nourish the skin with a conditioning body wash while scents of pure plant essences indulge the senses. Available in 8 fl oz. and professional sizes including gallon containers. 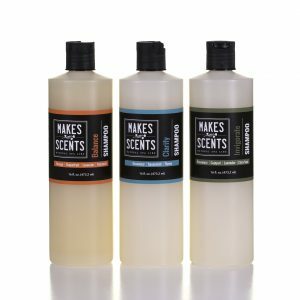 For professional spa product pricing, contact us by phone at 717-824-3094 or by email at Info@MakesScentsSpaLine.com. Body Wash is earth & animal friendly and is free of of parabens, formaldehyde, urea, mineral oil, petroleum, PG (propylene glycol), PEG (polyethylene glycol), harsh detergents like sodium lauryl sulfate (SLS) & sodium laureth sulfate (SLES), drying SD alcohol, DPG (dipropylene glycol), TEA (triethanolamine), MEA (monoethanolamine), DEA (diethanolamine), DEP/phthalates, butylene glycol, artificial colors and synthetic fragrances. Available in 8 fl oz. and professional sizes including gallon containers. 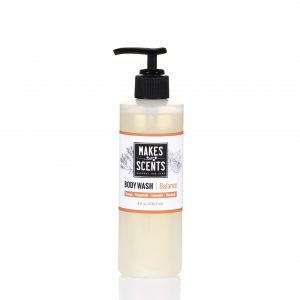 Balance Body Wash provides luxurious, gentle cleansing and leaves dry skin looking and feeling soft and healthy while essential oils of orange, pink grapefruit, lavender and patchouli balance and uplift the senses. Recommended for all skin types. Clarify Body Wash provides luxurious, gentle cleansing and leaves dry skin looking and feeling soft and healthy while essential oils of rosemary and spearmint purify and re-energize the senses. Begin the day with a clear mind and a clean body with Clarify Body Wash. Recommended for all skin types especially skin prone to blemishes. Invigorate Body Wash provides luxurious, gentle cleansing and leaves dry skin looking and feeling soft and healthy while essential oils of rosemary, cajeput, lavender and sage invigorate and balance the senses. Energize the mind and body and stimulate the senses with Invigorate Body Wash. Recommended for all skin types especially skin prone to blemishes.